This week we lost an American icon. Andy Griffith, star of “The Andy Griffith Show,” “Matlock,” and other American television hits, was also a stage actor and Southern-gospel singer. Andy was one of those rare actors who emanated warmth and gentility; watching him on screen felt like you were spending time with a good friend. It seems fitting that Andy ended his journey during the week of July 4th, when Americans are at their most patriotic. “The Andy Griffith Show,” Andy’s most iconic contribution to Hollywood history, was as American as apple pie. The mythical town of Mayberry, North Carolina played backdrop to a cast of quirky, simple, and lovable characters. Sheriff Andy Taylor, played by Griffith, was the heart of the show. His son, Opie Taylor, was played by Ron Howard– once an adorable redhead kid, now a famous Hollywood film director. Don Knotts played Barney Fife, the goofy deputy sheriff who helped keep watch over their sleepy little town. Frances Bavier played Aunt Bee Taylor, the maternal figure in Opie’s life and the best cook in Mayberry. Nary an episode went by without Aunt Bee cooking up some delicious Southern treat (she hailed from West Virginia). 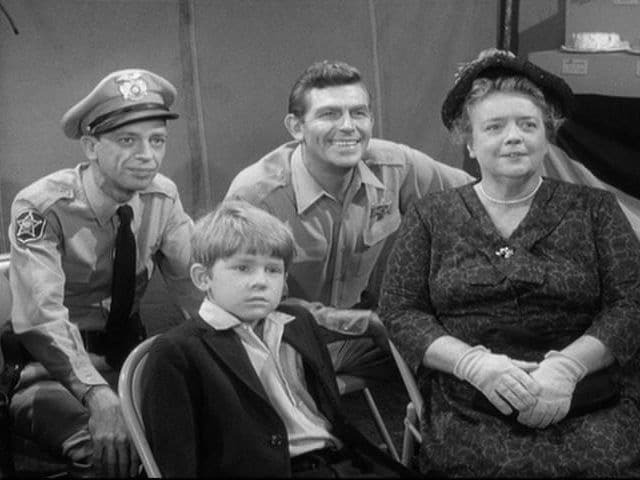 In fact, food played a big role in the show… when Aunt Bee comes to live with Andy and Opie, the first thing that Opie acknowledges about her is her ability to cook. I grew up watching reruns of “The Andy Griffith Show.” It was a comfort to me as a child, watching this window into a simpler time and place. This sweet town, the integrity of the characters, the gentle Sheriff Taylor playing straight man to Barney’s antics… watching the show always brought a smile to my face. 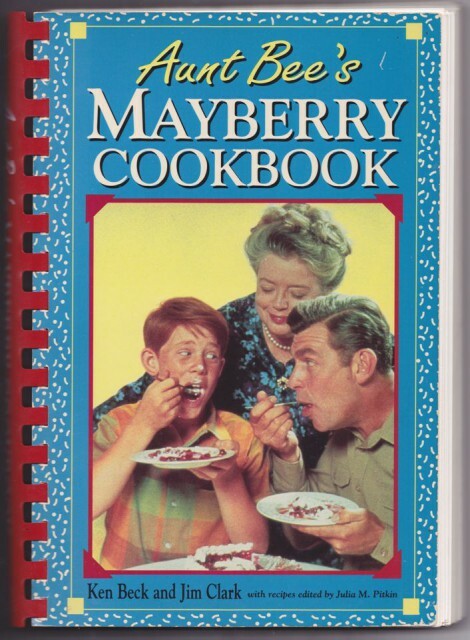 A few years ago, I picked up an out-of-print used cookbook called “Aunt Bee’s Mayberry Cookbook.” Originally published in 1960 and re-released in 1991, the book is a collection of recipes submitted by cast, crew members, and fans of the show. Because Aunt Bee was from West Virginia, the dishes are mostly Southern-inspired; there are also a few more worldly dishes sprinkled in for good measure. This week, when I heard about Andy’s passing, I flipped through the book. It’s full of still photos, bits of dialogue, and fun memories from the show’s 8-year run. When I bought it, there were only a few used copies available online. Since then, it has been made into a Kindle version, which you can download here. 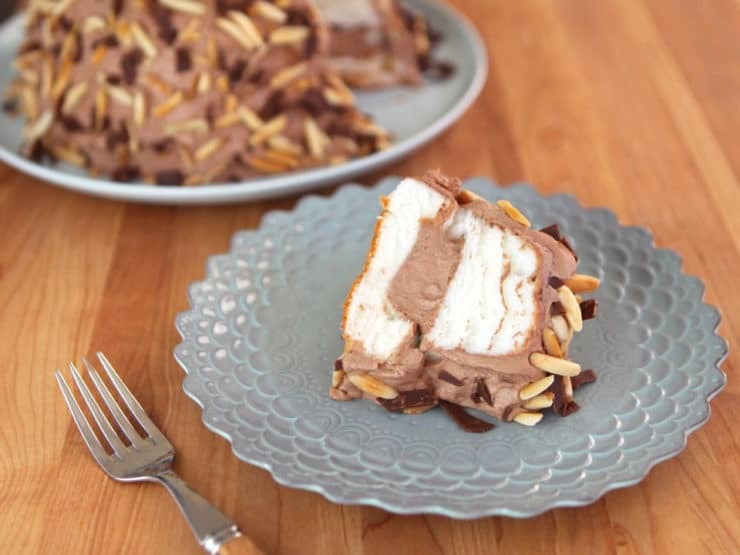 As I was looking through the book, a recipe caught my eye– “Andy’s Chocolate-Filled Angel Food Cake.” The recipe was submitted by John Faulkner from Greensboro, North Carolina. John was presumably a fan of the show, or perhaps a friend of Andy’s– Andy grew up in a small town called Mount Airy, North Carolina, which the fictional town of Mayberry was based upon. I could think of no better way to pay tribute to Andy than making a dessert with the word “angel” in the title, so I got out my mixer and went to work! I ended up adapting the recipe. Simple as it was, it needed a little help to take it from good to great. The original recipe called for whipping 1 1/2 pints of whipping cream with cocoa and sugar to create the filling and “frosting” for the cake. This turned out to be way too much cream for a standard-sized angel food cake. I found that halving the amount of cream left me with more than enough for both filling and frosting. I probably could have even cut it down a bit more… but better to be safe than sorry, plus it’s fun to lick the bowl if you have some leftovers. I also added shaved chocolate pieces to the outside of the cake. 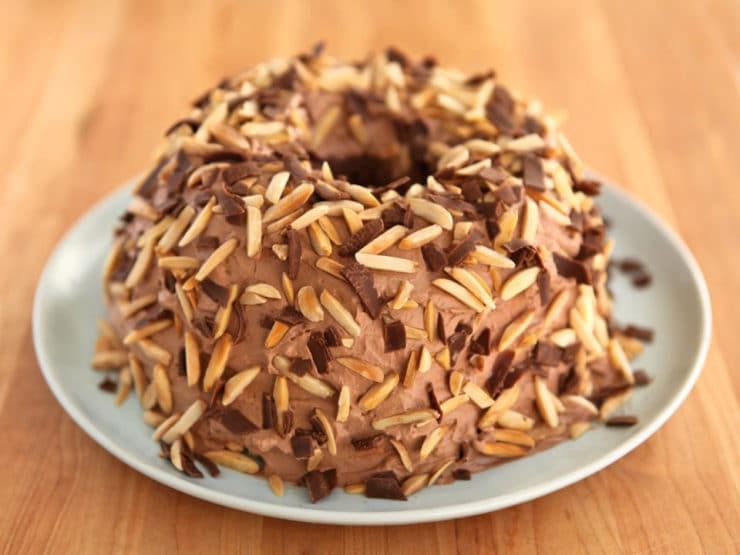 The toasted almonds alone left the cake somewhat bland; I felt it needed some extra chocolate in the mix to improve both the look and the flavor. The chocolate shavings added a perfect finishing touch. In the end, it turned out to be a lovely cake and a fun tribute to Andy. 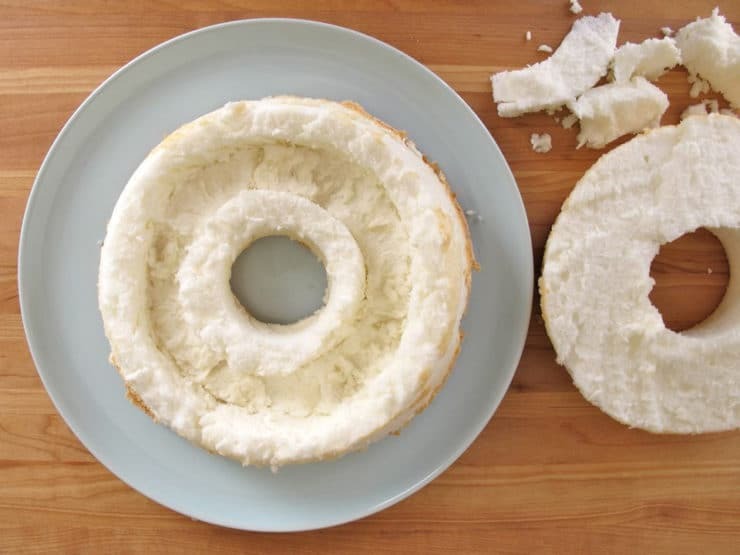 If you buy the angel food cake pre-made (I did, it was too hot to turn on the oven this week), it becomes a no-bake dessert– very easy to put together, and just perfect for summer. We will miss you, Andy. 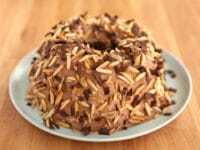 A vintage recipe from "Aunt Bee's Mayberry Cookbook" - a simple chocolate-filled angel food cake with nuts and chocolate shavings. 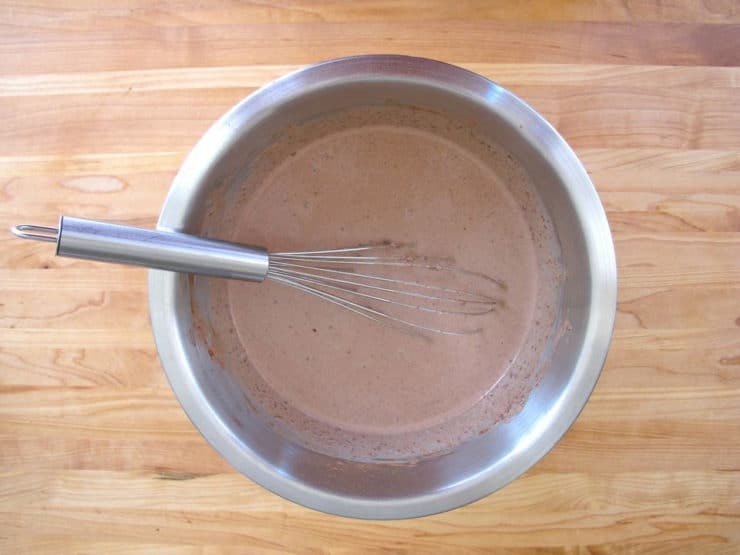 In a medium metal mixing bowl, whisk together whipping cream, cocoa, sugar, and salt. Chill the mixture for 1 hour. 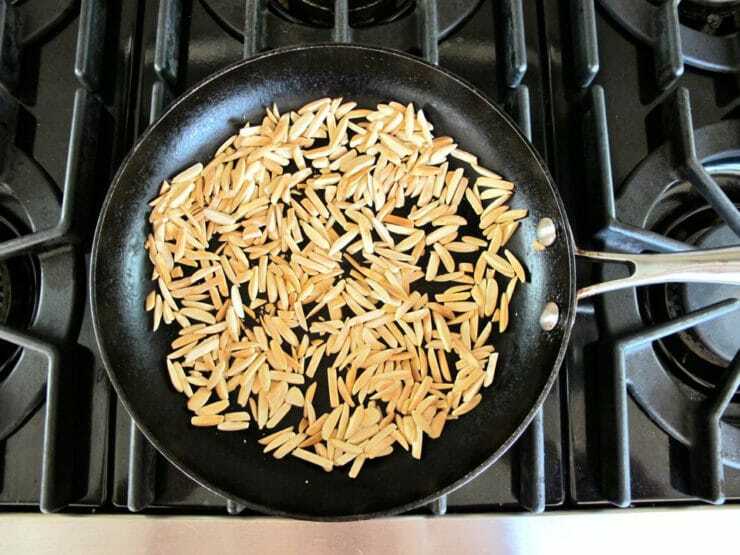 While cream is chilling, lightly toast the blanched slivered almonds in a skillet over medium heat till golden and fragrant. Reserve. Take a room temperature chocolate bar and turn it so the thin edge is facing upward. 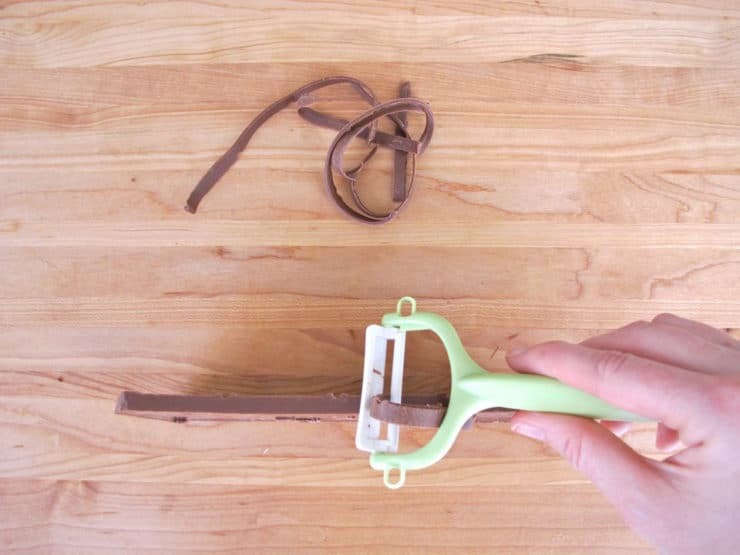 Use a vegetable peeler to shave the chocolate bar into thin shavings. Shave the bar about halfway down. 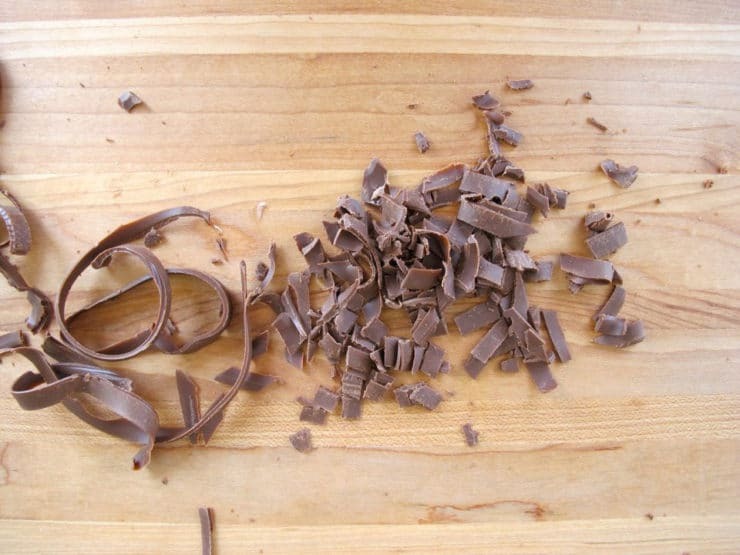 Chop the chocolate shavings into small pieces, about the same size as the slivered almonds. Reserve. If it's a hot day, store them in the refrigerator to keep them from softening or melting. 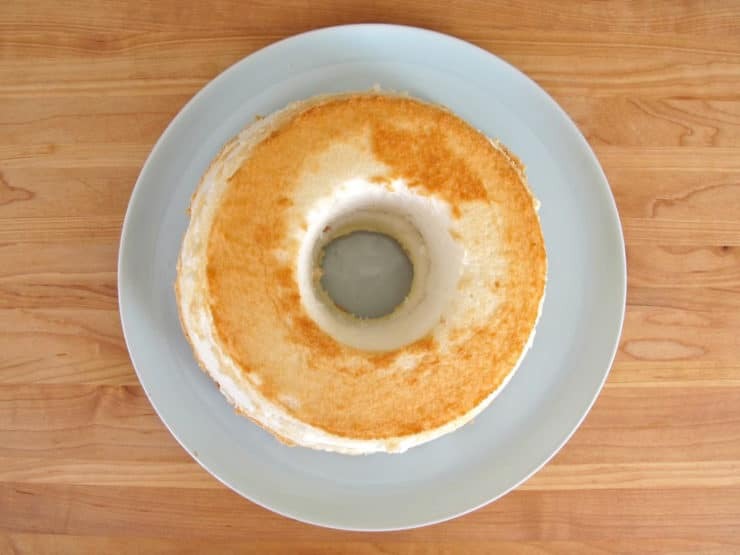 When the cream is chilled, before you take it out of the refrigerator, place your angel food cake on a serving plate. 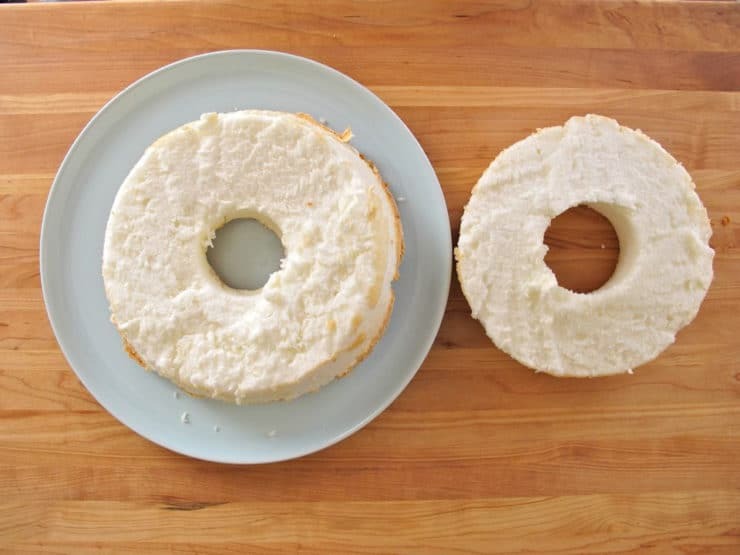 Slice the cake in half horizontally and remove the top half of the cake, so that you have two rings of cake. 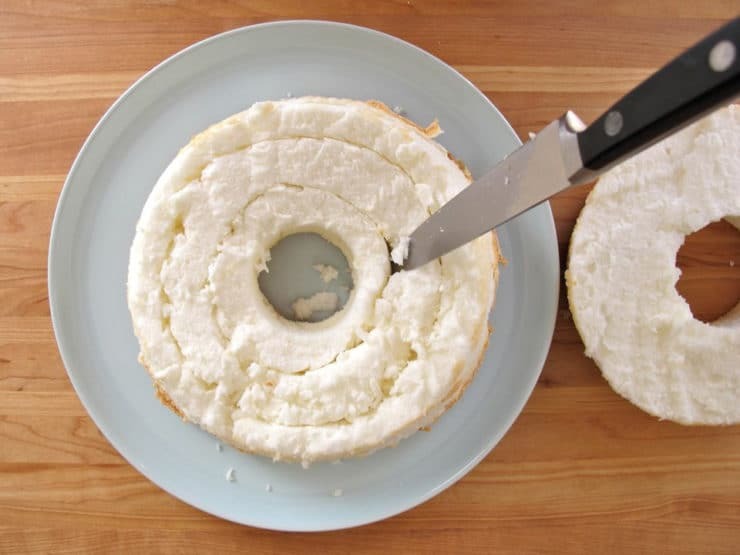 Run a knife around the bottom half of the cake, cutting a ring about 1/2 inch from the edge (wall) of the cake. 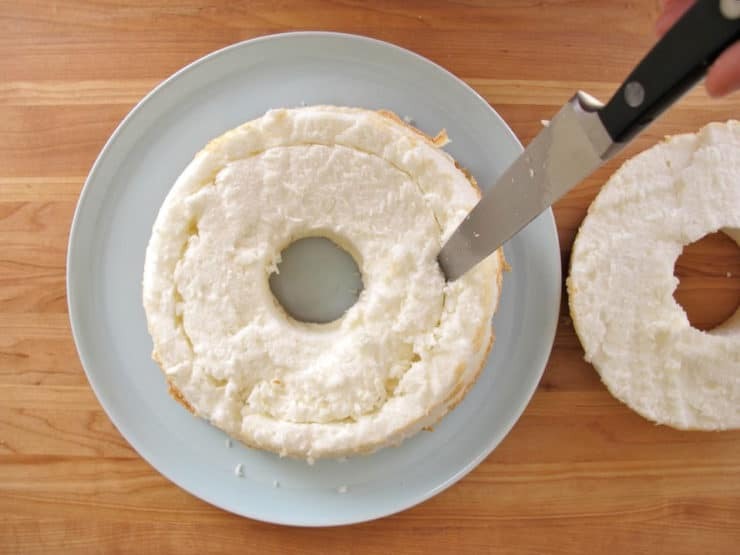 The knife should cut in no further then 1/2 inch from the bottom of the cake. Cut another ring about 1/2 inch from the center edge (hole) of the cake. Again, the knife should cut in no further then 1/2 inch from the bottom of the cake. 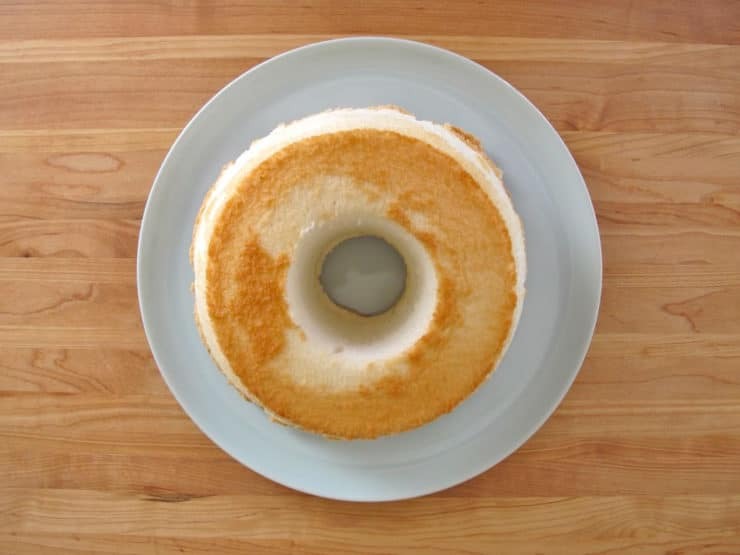 Scoop out the middle of the cake, between the two cut lines, to create a cavity ring all the way around the cake. Feel free to nibble on the cake pieces that you scooped out-- chef's treat. I won't tell. Take the chilled cream mixture out of the refrigerator. 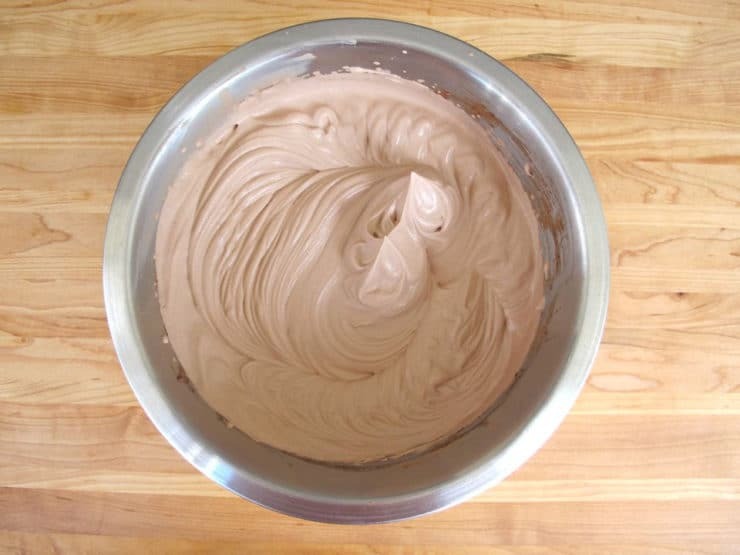 Whip it with an electric mixer till stiff peaks form and the mixture is spreadable, but still smooth. 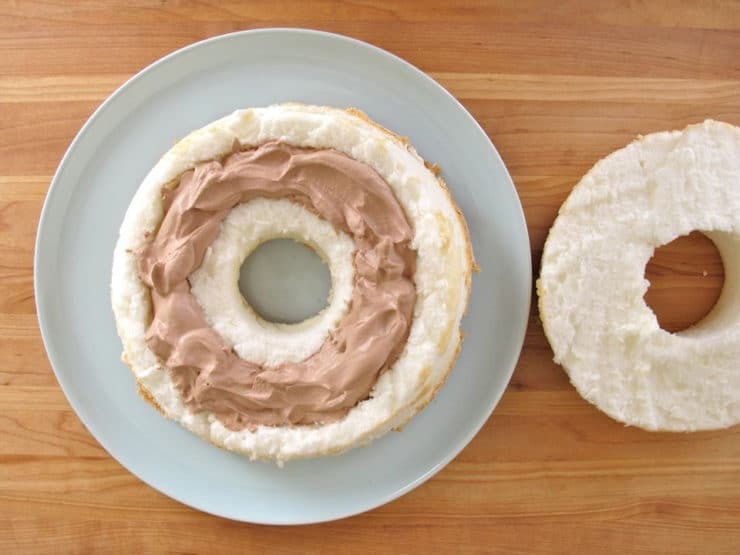 Fill the cavity in the angel food cake with the chocolate whipped cream to create a filling for the cake. 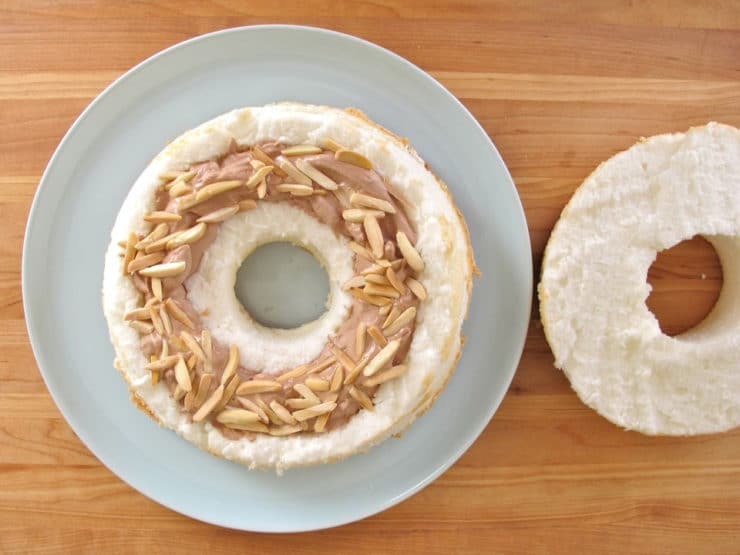 Sprinkle the cream filling with a thin layer of the almonds. 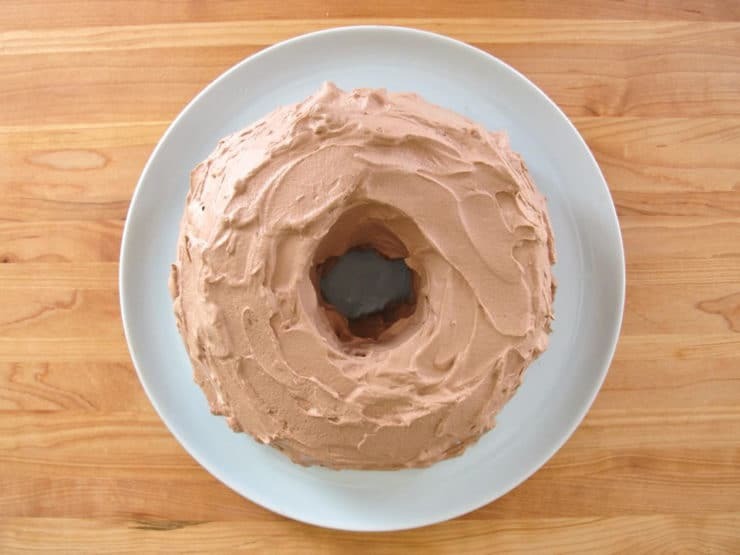 Spread the entire outside of the cake with an even layer of chocolate whipped cream. 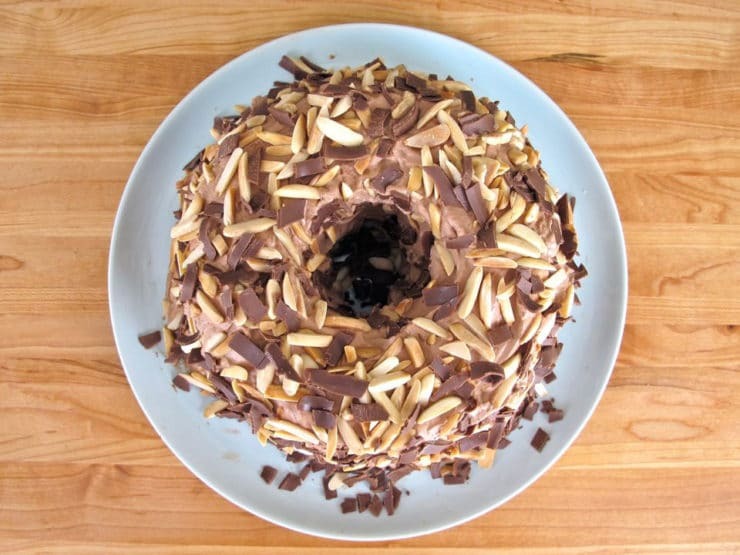 Sprinkle the exterior of the cake evenly with chocolate slivers and the chopped shaved chocolate pieces. Chill the cake for 2-3 hours before slicing and serving. Thanks so much for the tribute to Andy and Mayberry, plus the recipe. What a great way to serve a fabulous cake in the summer without turning on the oven! More than 40 years ago when I was just married, we had a dinner for friends and made a near identical cake, The filling had chopped chocolate mint truffles and the decoration was shaved chocolate with edible silver cake decorating balls. It was a hit – rich and delicious. There will definitely not be any leftovers. How could there be? That looks phenomenal! Do you think it would work with ice cream replacing the whipped cream then put in the freezer till time to serve? Hi Valerie! You could use ice cream in the center of the cake, but I would definitely use the whipped cream on the outside of the cake. I’m not totally sure how it would all work in the freezer… if you try it, let me know how it goes! I might not tamper with perfection! We have two August birthdays coming up and I think this cake will make an appearance at least for one of them. Tori, I love this post — what a lovely tribute. And the step-by-step of making this cake is perfect! And . . . yum!